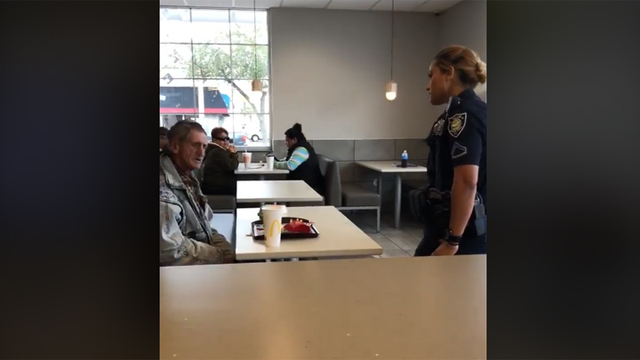 MYRTLE BEACH, SC (WBTW) – Myrtle Beach police are responding to a Facebook video that has been viewed millions of times of an officer asking a man, who appears to be homeless, to leave a McDonald’s restaurant after someone paid for his meal. A five-minute video was posted to Facebook Wednesday morning just after 11 a.m. The video shows a Myrtle Beach Police officer speaking with a man who is sitting at a booth eating his meal. The officer tells the man that after he finishes his meal he must leave the restaurant and can never return. The video, less than 24 hours after being posted, has been viewed more than 18 million times. The man who filmed and posted the video told the officer he personally paid for the man’s food and was not asked for money after the officer indicated several people called police complaining about the presumably homeless man asking for cash in an area outside the restaurant. The video concludes with the video taker and the homeless man getting into a vehicle to go somewhere else to have lunch. Myrtle Beach Police Captain Joey Crosby confirms the incident occurred at a Myrtle Beach McDonald’s restaurant and officers were dispatched to the location after receiving a call from a McDonald’s employee claiming a man was in the parking lot asking people for money. When the officer arrived at McDonald’s, an employee told the officer the man was now inside the restaurant and the employee wanted the man to receive a trespass warning and removed from the establishment. Capt. Crosby confirms that both the man eating and the man filming the incident were asked to leave McDonald’s and told they cannot come back. At my restaurant, the goal is to provide our customers with a positive and welcoming experience each time they visit. Unfortunately, the individual in this video has a history of disruptive behavior and has been asked to leave by management and police on several occasions. His unpredictable behaviors have created significant concerns for the safety and comfort of our employees and customers. Whereas we are compasionate [sic] of the individuals [sic] situation and admirable of the customers [sic] generosity, the restaurant acted to remove an individual that has a long history of disruptive and unacceptable behaviors which have negatively affected customer experiences.